Our Pop of Passion contest is tons of fun but there are a few rules to follow. The contest runs from Monday, August 24,2015 and entries must be received by midnight on Saturday, August 29, 2015. You must try on the bareMinerals Pop of Passion lip balm at Solutions. Your "selfie" must be taken at Solutions. You must post your picture on the Solutions Facebook page. Winner will be chosen by a random drawing. Winner will receive $75 worth of bareMinerals makeup and shampoo and style and complimentary makeup application services from Solutions. Winter is the perfect time to add a masque into your skin care routine. The harsh weather can leave your skin feeling dry and in need of nourishment. Adding a masque to your routine is one of the fastest and easiest ways to see visible changes in your skin. Our masques from Eminence Organic Skin care are super effective because they are packed with concentrated vitamins and nutrients that are easily delivered to the skin. Using a masque just once or twice a week is a perfect way to reveal your skin’s natural vibrance. We have masques that will treat your specific needs whether you have problem skin, redness, or just want a little help erasing time. Our knowledgeable esthetics team can help you choose the masque that’s right for your skin needs. Ask us about our current skin care specials and add a masque into your skin care routine today! Now through the end of February, treat yourself of someone you love to one of our featured facials which are specially customized to meet the needs of skin during the dry winter months. 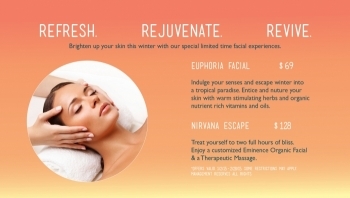 Indulge your senses and escape winter into a tropical paradise with our Euphoria Facial. Entice and nurture your skin with warm stimulating herbs and organic, nutrient rich vitamins and oils. This facial is available for a limited time for just $69! Anti-Aging skincare is all over the market and it can be tough to tell what works, what doesn't, and what is just a bunch of hype. We are big believers that you should consult with a licensed esthetician before taking on any skincare regimen in order to get the most out of the experience. There is such much to consider when choosing skin care products and a licensed esthetician can make things easy to understand. So we'd like to share some key ingredients we believe you should look for and consider when choosing your Anti-aging skin care. Alphahydroxy Acids- Organic compounds that smooth the skin, thicken the underlying tissues by boosting collagen which intern creates firmness and reduce wrinkles or the signs of aging, and improve the overall look and feel of the skin. RetinolA- Chemical compound derived from vitamin A. Its primary function in skincare products are to increase the skins cell turnover and intern will reveal new healthy skin.Retinol also stimulates an increase of collagen production, creating firmness. Vitamin C- Is an antioxidant for the skin. Increases collagen production, a skin brightener, strengthens the skins barrier response when skin is faced with outside damaging pollutants, enhances the skins repair process, reduces inflammation and increases sunscreen performance. One important key to remember is that unstable vitamin C can have adverse results to the skin so be sure your vitamin c is stable.Vitamin C much like when taken internally boost skins immune response to keep it healthy. Vitamin E- Are lipid soluable compounds which Protect cell membranes from oxidative damage from daily wear and pollutants. Vitamin E prevents collagen from being destroyed and brokendown and acts as a healing agent to prevent scarring. Vitamin E works beautifully when paired with Vitamin C . These two are the power house of antioxidants that act as a shield to protect the skin. Omega 3 Fatty Acids- Also known as Linoleic, Linolenoc acids or phospholipids. These fatty acids replenish and preserve the skins intercellular matrix. Omega 3 fatty acids are cell communicators which tell damaged cells how to behave in a healthy manner. Hyaluronic Acid- Acts as a drink for your skin by drawing water moisture towards it. Hyaluronic acid deeply hydrates dehydrated skin. A high percentage of us have dehydrated skin and do to this your skin needs the extra help. Much as a raisin is wrinkled and has loss of its natural juices if reinjected with liquid it will appear healthy and plump again so is the same with our skin. HydroquinoneIs- A skin brightener and lightener. Hydroquinone evens out the skins tone by lightening discoloration due to sun exposure, aging, and hormone fluctuations. Hydroquinone supresses and lightens thus eliminate the concentration of melanin in the skin. Peptides- Are anti-aging proteins that produce collagen,restores elasticity, promotes cell metabolism, heals post acne areas and scars, reduces fine lines and wrinkles.Peptides signal the skins cells to let them know how to function the most optimal way also teaching our skin to perform at its best. Stem Cells- Phyto (plant) derived stem cells repair damage cells. Aging skin is damaged skin so by applying stem cells that can correct the skin giving back skins dewy finish and improves skin elasticity. Studies have shown that plant stem cells may be stronger than our own human stem cells. The skin is complex and functions in many different ways. These ingredients in the correct form can improve the skins functions and protect the skin from aging. As always proper internal health and care is a must in conjunction with proper use of topical ingredients as well. Sun protection is a must in any Anti Aging skincare regiment and it is imperative I cannot stress this enough. This month, Solutions is offering our special Age Corrective Facial for just $69! 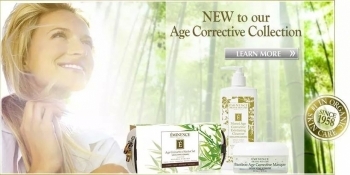 PLUS....get 20% off the NEW Age Corrective starter set! Thanks to Heather Hunt for sharing this great information with us!